Ruth Van Kampen, 91, passed away peacefully in her sleep on Sunday, Dec. 31, 2017 at Lakeside Vista of Holland. She was born in Diamond Springs, Michigan on August 4, 1926. She attended Holland Public Schools and graduated in 1944. While in high school Ruth met the love of her life, Warren Van Kampen and they married after his tour of duty in the Navy. They were married for 37 years before he passed away in 1983. After raising 3 children, it was Warren’s encouragement that motivated Ruth to go to college where she earned a BA and Master of Arts degrees from Western Michigan University. After graduation she became an instructor of Sociology at Hope College for nine years. Following that she was the Director of Volunteer Services for Holland Hospital. Ruth was a lifelong learner with many hobbies and passions. She learned Spanish, took up painting, was an avid birdwatcher, loved to garden, enjoyed poetry, loved to read, was a member of HASP, and enjoyed traveling with family and friends. Several times she accompanied Hope students in their studies abroad. 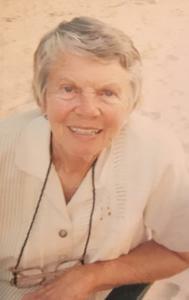 Ruth was an active member of her community. She volunteered for Hospice, Kids Hope, and was a member of the Alliance for Cultural and Ethnic Harmony, to name a few. Ruth was preceded in death by her mother, Hattie Arendsen, her aunt, Alice Arendsen, and her husband, Warren Van Kampen. She is survived by her beloved children: Warren Bruce Van Kampen, Sandy Van Howe, Deb and Tim Locker; grandchildren: Lisa and Mike Johnson, Jackie and Shawn Van Kampen-Rivas, Laura Van Howe, Charlie and Stefanie Van Howe, Tim and Erin Locker, Nora and Ricky Keller; and 12 great-grandchildren and 1 great-great-grandchild. Ruth was also preceded in death by her great friend and companion of 20 years, Harold Vande Bunte. She has always held Harold’s children and grandchildren close to her heart. Ruth’s family would like to thank Hospice of Holland and the staff of Delph Haus at Lakeside Vista for their compassion and support. Visitation is 9:00am to 10:45am, Thursday, January 4, at Hope Reformed Church, 77 West 11th Street, Holland, MI. A funeral ceremony will be held after visitation at 11am, at Hope Reformed Church. A luncheon is to follow the service. Pastor Jill Russell will officiate the service. Memorial contributions may be given to Hospice of Holland, 270 Hoover Blvd, Holland, MI 49423 or Community Action House of Holland, 345 W 14th St, Holland, MI 49423. To sign an online register book visit www.dykstrafuneralhome.com. Arrangements were made by the Dykstra Funeral Home - Northwood Chapel.